Periurban Country Parks” is the term given to "those natural areas located near a city, either man-made or otherwise, which are declared as such in order to adapt their use to the recreational needs of the population, which is their main purpose" (Act 2/89 dated July 18th by which the Inventory of Protected Natural Areas in Andalusia is passed). Los Villares Periurban Country Park was the first nature reserve of its kind to be created in Andalusia. The traditionally large number of visitors to the former 60 hectare Forest Park led to 484 hectares of hillside being declared a Suburban Park under the name "Los Villares Bajos" and to the extension of its use by the public. This was facilitated by establishing protective measures to conserve its most attractive features and by adapting its use to the existing recreational and educational needs, as well as allowing people from the nearby city areas to get closer to nature. -Bird Recovery Centre (C.R.E.A. ): Containing specimens of the most representative wild bird species in Andalucia. By visiting and getting to know these individuals, we can understand the major problems facing them and other species of birds, including collisions with fences, power lines, wind turbines and other obstacles, electric shocks from unprotected power lines, being run over by cars, illegal hunting, trapping and shooting, and so on. To visit these facilities, a Guided Tour must be arranged at the Visitor Center. AREA 2. - ENDANGERED SPECIES RECOVERY CENTER (CREA): One of its objectives is to recover specimens of threatened or protected animals in order to inform the general public of the negative effects of human interference with wildlife, and to define what the Ministry of Environment can do to minimize and reverse, where possible, such effects. Closed to visitors. This is the coordination centre for preventing and putting out forest fires in the province of Cordoba. It contains a helipad and an airstrip. Visits to the facilities can be arranged. AREA 4.- Sports pitches: football, five-a-side football, basketball and volleyball. Free and open permanently. -Restaurant: Currently open on Saturdays, Sundays and holidays. Services for picnickers. Events. Rice dishes (“perol”) available when booked in advance. -Recreation Area: The recreation area is equipped with toilets, barbecues, tables, benches, sun shades, covered barbecues, children’s playground and obstacle course. -Lighting fires for barbecues is permitted from October 16 to May 31 each year, and is restricted to designated areas within the Recreation Area. In the surrounding area there is also a Lookout point, the “Shady Forest Path” (Accessible) and the “Path of Tranquility”. 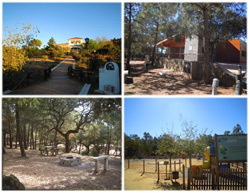 Los Villares Periurban Country Park is located in the Sierra de Cordoba (Sierra Morena), about 8 km from the city.